As a service to our customers, we offer the highly respected Watercheck™ and Citycheck™ comprehensive water tests from National Test Laboratories, LTD.
National Test Labs water reports have become the gold standard in home water testing because of the laboratory's prompt, reliable service, the reasonable cost, and the clear, easy-to-understand reporting format of the tests themselves. Test results are color-coded for easy interpretation and all aspects of the test are clearly explained in English (not the usual technical gibberish of water test reports). A high quality water test is worth many times its cost. Whether you have a private water source or get water from a city supplier, a top quality independent water test will give you extremely valuable information about your water. If you find out that you have great water with no significant treatment issues, that is the most valuable information of all, and the test pays for itself many times over, both in peace of mind and in avoidance of purchasing unneeded equipment. If you learn that you have an unsafe level of a health-threatening substance (like lead, arsenic, E.coli, chromium, or fluoride) that needs immediate treatment, the test pays for itself many times over. If you are planning to treat a known water issue, like hardness, iron, or an unpleasant odor, a reliable, easy-to-understand independent test will give you precise information about the issue in question and provide a full picture of your water so you can select the most appropriate and cost-effective treatment. The test, again, pays for itself many times over. When you consider the total cost of providing water for a home, a good water test is a minor expense, and the information you receive always pays for the test. National Test Laboratories tests are not home test kits. Testing is done by certified laboratory scientists using the best testing equipment available. Your participation consists of collecting the samples according to instructions and overnighting them to National Test Laboratories. The kit that you receive from us includes clear, detailed instructions, a freezer pack to assure that a fresh sample arrives at the laboratory — everything you need to collect the samples and the shipping container and paperwork for sending your samples to the lab. Watercheck™ Test Kit from National Test Laboratories, LTD. 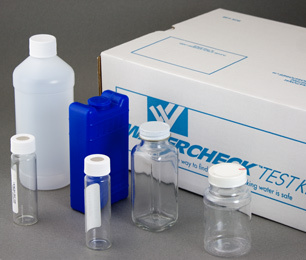 The Watercheck™ test is National Test Lab's most popular test offering. The Watercheck includes all of the main water treatment issues that apply both to wells and city water. It looks at 83 separate water issues, including bacteria (presence/absence for coliform and E.coli), nineteen heavy metals and minerals, six other inorganic chemicals, five physical characteristics, four trihalomethanes and forty-seven volatile organic chemicals. We also offer an upgrade test called Watercheck™ with Pesticides that adds tests for an additional twenty pesticides, herbicides and PCB’s. This is a valuable option that you should consider if your water comes from a lake or pond or from a well in an agricultural region. In our opinion, the two comprehensive Watercheck products below are the best choice for most situations, both for municipal private water supplies. However, there are more testing options listed below. The price below is the full charge to you for the testing. We pay National Testing Laboratories' fees as well as shipping of the test kit from us to you. Your only additional expense will be overnight shipping to the NTL test location. Citycheck is a basic testing package that targets the most common contaminants found in municipal water supplies. This includes basic physical characteristics, heavy metals & minerals and a wide range of common disinfection chemicals and disinfection by-products. Citycheck is recommended if for customers on municipal water sources who are concerned about VOC and heavy metal contamination. The Wellcheck test package is designed for customers that need basic bacteria and heavy metal testing on their well water supply. Wellcheck tests for common well water contaminants and characteristics such as arsenic, iron, manganese, ph and hardness. It is an excellent test package for an initial diagnosis of basic well issues and for ongoing well bacteria monitoring. The following single analyte tests can be purchased individually without a test or as a additional feature for a Wellcheck, Citycheck or Watercheck test kit. The following analytes are available as addons for the Watercheck, Wellcheck or Citycheck test packages. These addons must be purchased with a full test kit. They are not available as individual tests.